In the heart of Tenjin, downtown Fukuoka, lies a strip of malls connected to the Nishitetsu Station and train line. These malls, from Mitsukoshi, to Solaria, to Parco, all have different styles of shopping experiences, geared at different demographics. 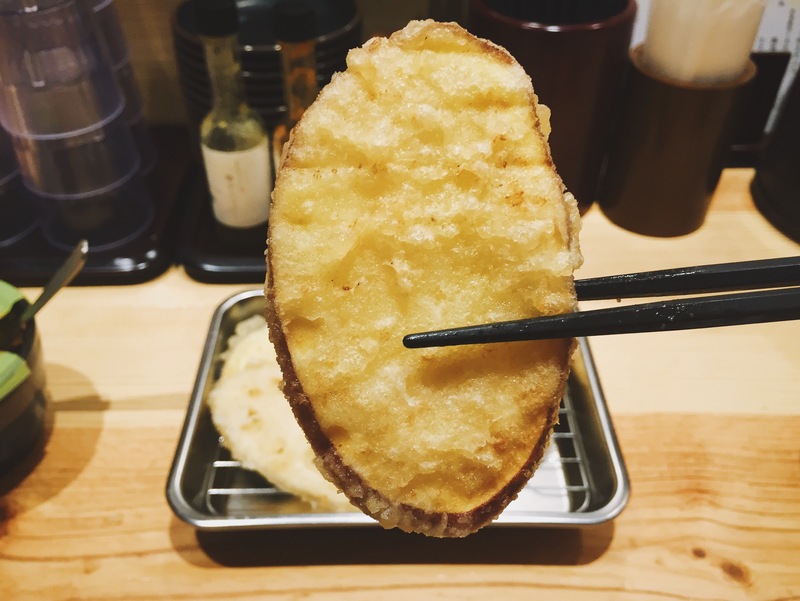 Mitsukoshi tends to draw in the older, more mature crowd, while Solaria is geared towards teenagers and young adults, Parco similarly appeals to youngsters, albeit those with a little more money to spend. However, shopping aside, there’s one thing these malls have in common, and that is the underground restaurant arcade. You can walk from the basement of Mitsukoshi, all the way to Parco on the other side of the street, making your way through underground “food courts” and restaurants. 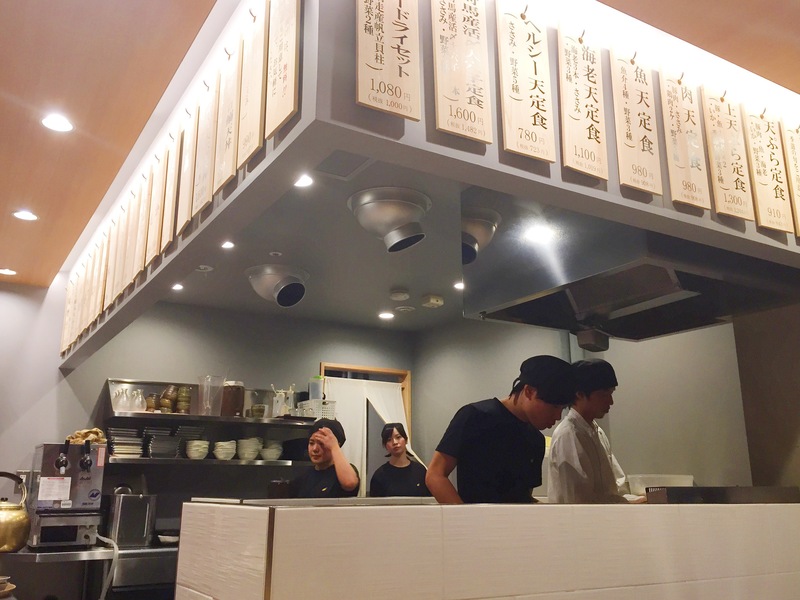 When you order a “set” from Tempura Takao, you are immediately presented with two sets of “tsukemono”, pickled cabbage, and, Takao’s specialty, “konbu mentai”, or “kelp and cod roe”. 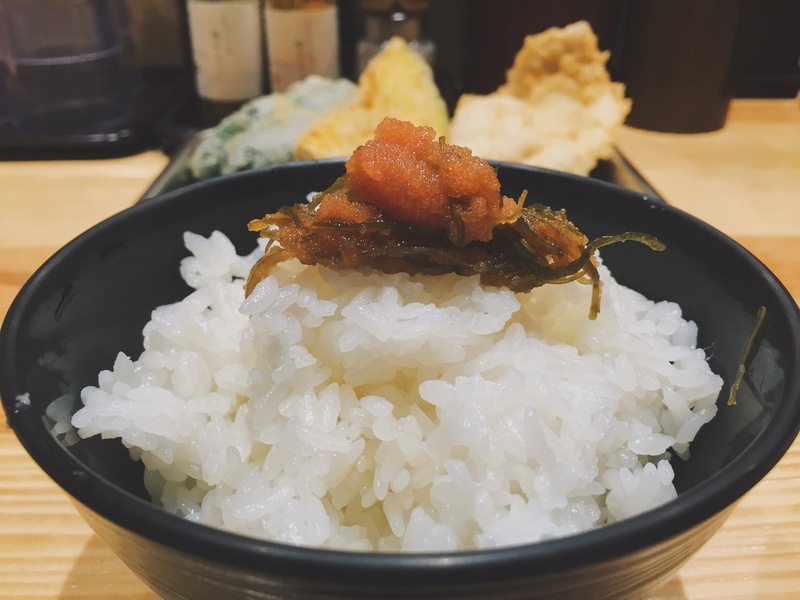 Mentai, as I’ve mentioned before, is a delicacy unique to Fukuoka and, once you’ve developed a taste for it, it’s quite good, it’s spicy, with a hint of fish taste, and it just goes excellently with plain hot white rice. Good tasting mentaiko is not very cheap, which is why it’s surprising that these two “tsukemono” are served as “all you can eat.” Yes, you can take as much as you’d like, to eat with your rice and miso soup, as you’re waiting for your tempura to be fried. The “Healthy Set” cost 720 yen, and included, 5 vegetables (green pepper, pumpkin, lotus root, sweet potato, and eggplant) and one piece of chicken. 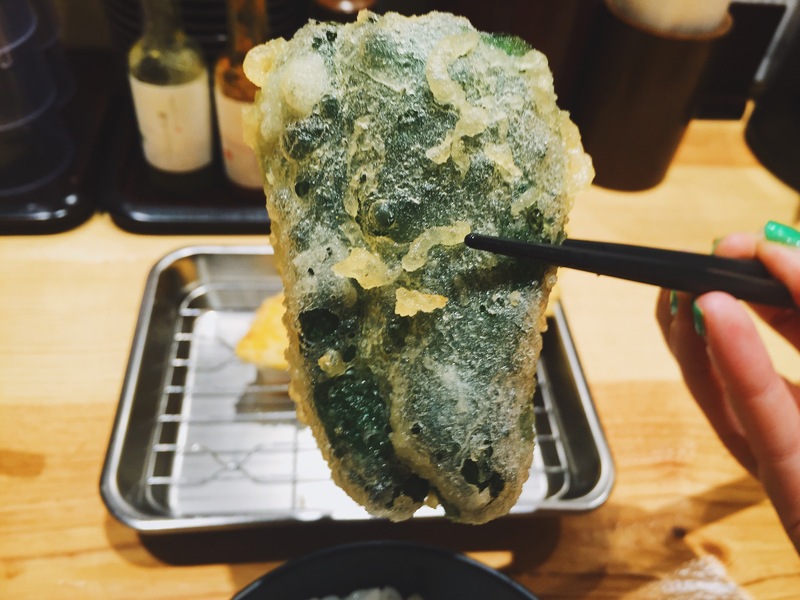 Considering how oily tempura can be, especially with meat, I prefer this set the most! The vegetables are served crunchy on the outside, and hot on the inside. 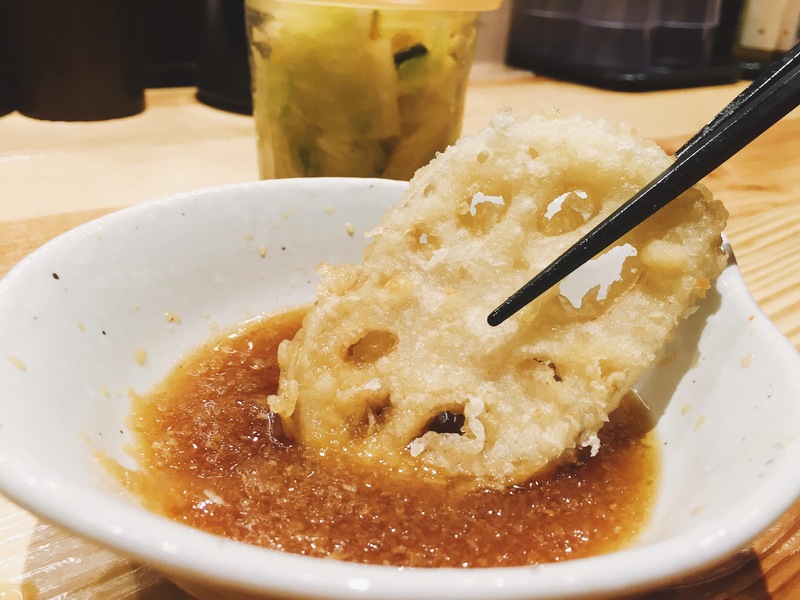 I love the lotus root (called “renkon”, in Japanese) the best. 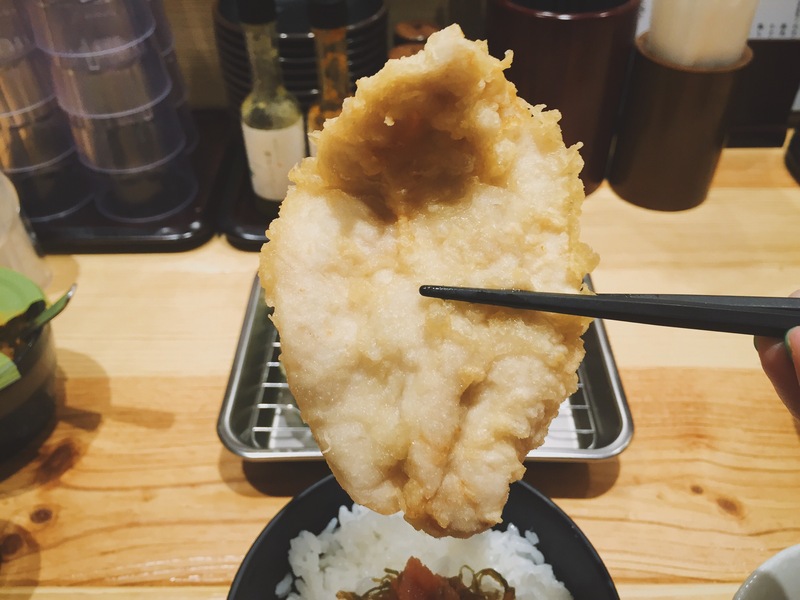 Dip your piping hot tempura into the dipping sauce provided and eat it in between bites of your white rice and sips of hot miso soup, and for 720 yen, this is a very filling meal. 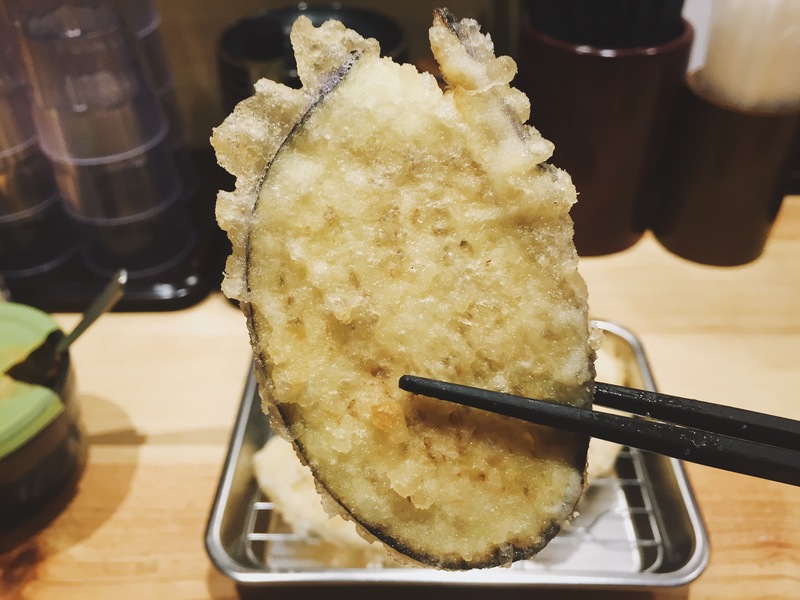 If it gets to feel too oily, as tempura sometimes does, you can wash it all down with a refreshing glass of oolong tea, which is also unlimited by the way. Oolong tea is said to be excellent for stripping the excess oils from your body. 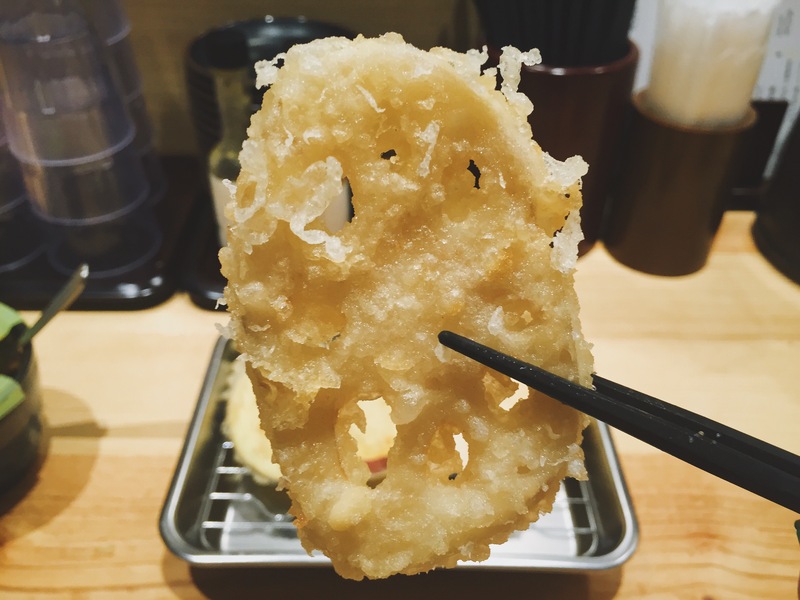 And if you feel like you didn’t order enough, you can always order individual pieces of tempura at extra cost, straight from the counter. Don’t be afraid to ask! Anyway, I felt I should write about this place because I think, considering it’s location, accessibility, atmosphere and affordability, this is a must-try place for tourists visiting Fukuoka City. It also helps that they have free, fast wifi, so it’d make a good pit-stop for travellers on the go, looking for a place to recharge and figure out their next destination. 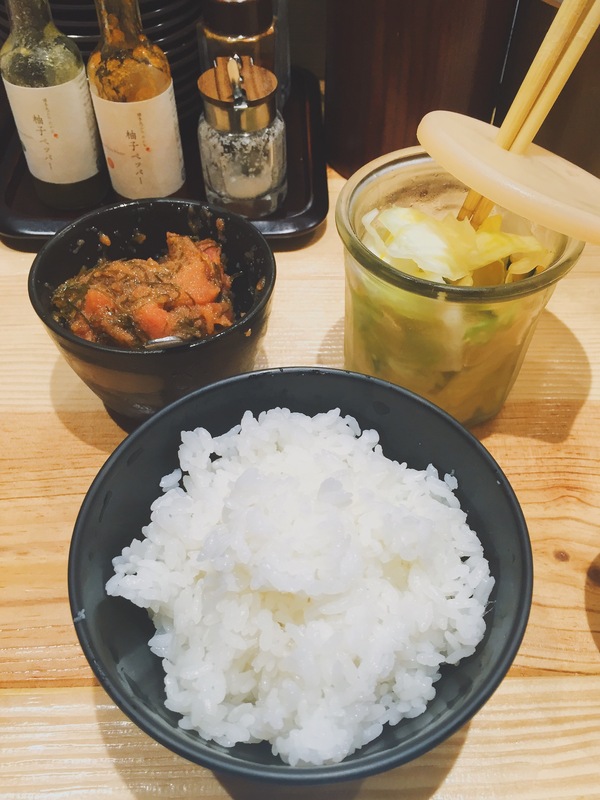 Posted in Asia, おすすめ, アジア, レストラン, 福岡, Dining, 英語, 観光, Food, fukuoka, Japanese Food, 日本語Tagged Asian, ニッポン料理, パルコ, ミカエラ, レストラン, Blog, ciaela, 福岡, 紹介, English, 英語, 食べ物, 観光, food, Food Blog, Foodie, fukuoka, japan, japanese, japanese food, Kyushu, Mentai, Mentaiko, Micaela, Micaela Braithwaite, restaurant, Tempura, Tenjin, Tourism, 博多天ぷらたかお, 天ぷら, 料理, 日本, 日本語, 明太子, 九州Bookmark the permalink. Thanks for this post. 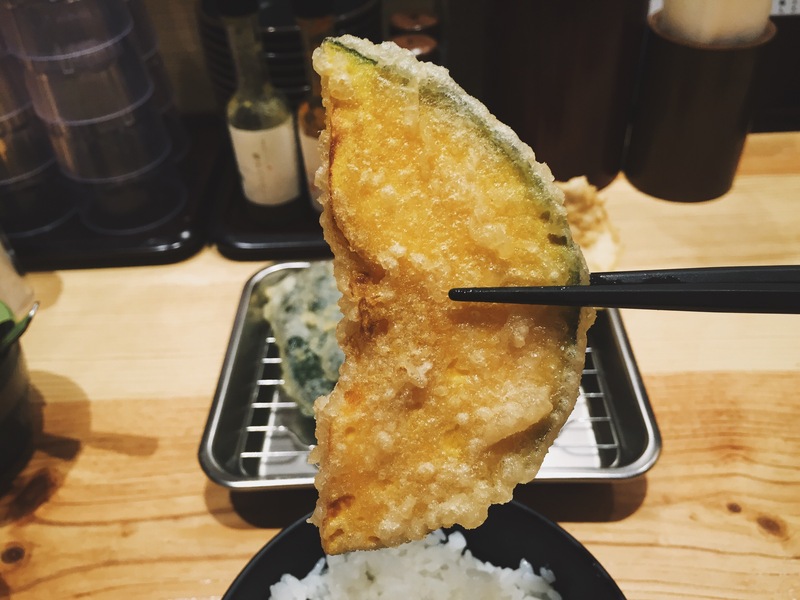 I am still figuring out what my sister and I will be up to in Fukuoka and this helps us help pick and gives us some options that are off the tourist beaten path. My grandfather ‘s hometown is Fukuoka. 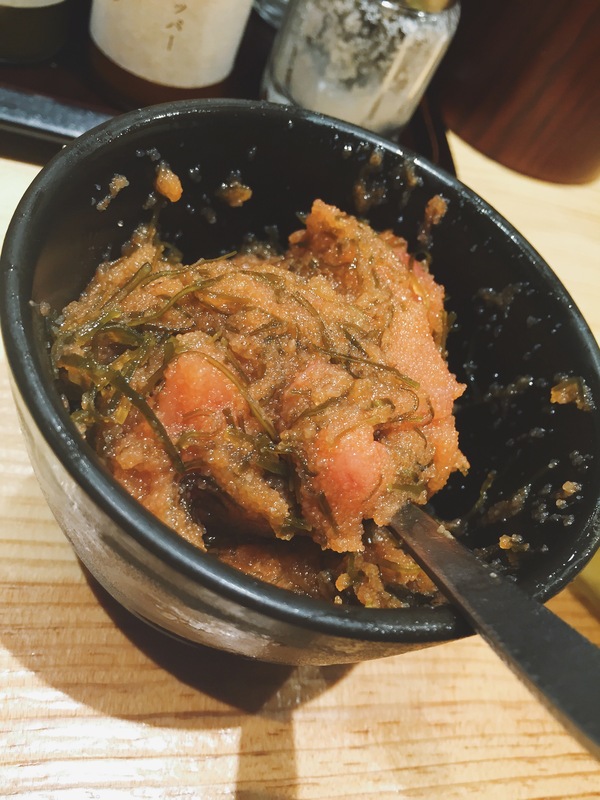 Have you been to Moji kou ? My recommend food is Yaki curry. Please try to eat !